In November 1977, Charles Oropallo authored and implemented an online Bulletin Board System (BBS) called Access-80. It operated on a Radio Shack TRS-80 Model I, Level II microcomputer. There were only a handful of such systems online for public use on the entire planet at that time. Charles founded CharlesWorks® in June of 1998 in order to provide reliable and affordable hosting solutions. At that time he was only providing Internet connectivity for several personal websites at very low speed. Over time, Charles's desire to provide reliable (as well as still being affordable) Internet solutions moved CharlesWorks® into more commercially oriented markets. Charles still helps individuals get personal sites on the web. Let CharlesWorks® get you out here onto the web with your own web site today! Click here for an affordable solution coupled with the best customer service in the field. To get you started, CharlesWorks® offers .biz, .com, .info, .name, .net, .org, .us, and .ws domain names with full privacy for only $15.00 per year! Call CharlesWorks® today at 603-924-9867 to see how easy it is to get started! Charles wrote a host program in assembly language and a bulletin board system (BBS) program in BASIC that ran on this system. The message handling program he named "email" (and still wishes he had registered it with the United States Trademark and Patent office). Its purpose was to provide a personal messaging system for local computer enthusiasts. It was originally placed online in East Greenbush, New York with a 300 baud modem and home brewed auto answering device. As a frame of reference, today's telephone dial-up can run as fast as 53,300 baud. At that time, there were only a handful of such systems available for anyone with computers and modems to dial in to. Shortly after, it was concurrently placed online in Schenectady, New York. In 1982, Charles moved from the Albany, New York area to Nashua, New Hampshire, and so did Access-80. 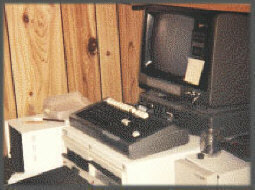 Charles's original Nashua Access-80 setup is shown above. It was not long before it was concurrently online in Londonderry as well as Nashua. Access-80 remained online until 1987. CharlesWorks can make your web presence happen for you! A typical small business web site is hosted for only $19.99 per month. There are other more robust packages and products offered as well for our larger clients.